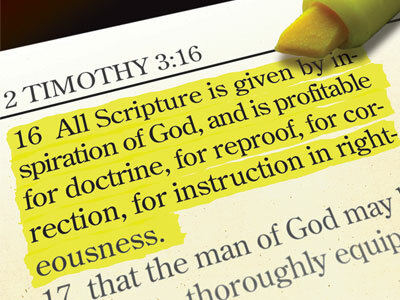 “All Scripture is given by inspiration of God, and is profitable for doctrine, for reproof, for correction, for instruction in righteousness, that the man of God may be complete, thoroughly equipped for every good work.” (2 Timothy 3:16). The articles on this website are written on the understanding that (a) the Bible is the inspired Word of God, and (b) the Bible should be the final arbiter for issues of the Christian faith. This article elaborates on these two important aspects. 2 Timothy 3:16 tells us that “all Scripture is given by inspiration of God”. The word “inspiration” is the Greek word theopneustos, which may literally be translated “God-breathed”. So we see immediately that God Himself “breathed” the Scriptures. This means that the Bible is God’s words and thoughts to us. The various books that make up the Bible were written via God’s chosen instruments who were moved, or literally “carried”, by God’s Spirit (2 Peter 1:21). The Bible does not consist of thoughts which are human in origin, even though its teaching is expressed in the language of humans for our understanding. Over the centuries questions have arisen over the validity of some books of the Bible. It is my contention that today’s Bible of 66 books, sometimes referred to as the “Protestant Bible”, is what God intended us to have. The entire New Testament canon has been discussed and reaffirmed many times since the 4th century A.D., when its 27 books were finally accepted as authoritative, true and inspired. It has remained the same ever since, mainly because those who compiled the canon agreed that the New Testament we now have was penned by people who had reliable accounts from eyewitnesses (Luke 1:1-4). Also they saw that it is compatible with the Old Testament, and that it shows consistency with events that took place simultaneously in the secular world. Likewise, the make-up of the Old Testament is frequently endorsed by the New Testament, and especially by the Lord Jesus who quoted and made reference to it regularly. Significantly, He never quoted from the many apocryphal books, such as 1 & 2 Maccabees, Judith, and others. Such apocryphal books may be helpful to us, but they are not God-breathed and should not be considered as part of the Word of God or to hold the same authority as the 66 books of the Bible. Further to this, each word of the Bible, from Genesis to Revelation, is of God’s choosing. By this is meant that not only are the concepts and messages inspired, but literally every word is inspired. The importance of the very words themselves is an idea reinforced over and over in the Scriptures. For instance, the Lord indicated that not even the smallest part of a letter or word could be erased from the Law (Matthew 5:18); and we read that the words of the Lord are pure words (Psalm 12:6). In Galatians 3:16 Paul builds an argument around the difference between “seed” and “seeds”, and there are warnings about adding to or subtracting from God’s words in Revelation 22:18-19 and Jeremiah 26:2. Each word is vital to the whole. Throughout this website, the contributing authors often refer to the original languages when examining a certain passage of Scripture. For example, an author might refer to agapao and phileo being two Greek words from which “love” are translated in our English Bibles. This is because we believe that the Bible is inspired and totally without error as written in the original languages – Hebrew and Aramaic for the Old Testament, and Greek for the New Testament. So it should be kept in mind that English translations are exactly that – translations of works first written in other languages. Such translations cannot be “inspired” or “God-breathed”. However, even though the Bible was first “God-breathed” in other languages, we cannot and do not say that English translations are of no use. After all, how else would most English speakers be able to read the Bible if it had not been translated into our own tongue? It should also be noted that the Scriptures were originally written in a continuous form, without breaks between each word, and that punctuation, and chapter and verse divisions, were all added many years after the original manuscripts were God-breathed. Again, while these can be helpful to us, they are not strictly part of the inspired Word of God, and can even be misleading at times. The Bible is the very thoughts and words of God Himself, who cannot lie. The Scriptures are therefore the instrument by which all beliefs and doctrines should be measured. However, there is a trend among some Christians today to acknowledge the Bible’s authority by word of mouth alone. That is, lip service is given to the high place of Scripture, but in reality many of us can be swept along by the personal opinion of others and the moral viewpoints of the day. Sadly, this can be combined with a tendency not to look carefully at the words of the Scriptures themselves. In this way an understanding of the things of the faith is that which has been passed on “second-hand”, from church leaders and friends, from hymns and Christian songs, from books and recordings. Such a method of “learning” can be helpful, and may be necessary when we first become a Christian, but it can also take us further and further away from the truth that is written in the Word of God. The Bible must be always consulted to see if what is being taught is so. It must be used for verification, for it is the sole arbiter and ultimate authority. Among other things, the Bible is a collection of books about God, and His dealings with mankind. There is much we can learn, and many things we may never know, but how can we expect to know the things of God apart from what He, as the Author of the Book, chooses to reveal to us about Himself? If we do not examine the Bible for these things, then we are only guessing or making things up. The revelation of His will and plans have been made by Himself, and we have it written for us in the Scriptures – God’s words and thoughts (2 Timothy 3:15-16). It is therefore significant that the Lord Jesus, as part of the Godhead, is often recorded quoting the Old Testament (e.g. at His temptations, Luke 4:1-12; see also Matthew 11:10; 21:13, etc). He clearly treated the Scriptures as a source of authority. Likewise, the writers of the New Testament commonly use the phrase “it is written” in their epistles in reference to the Old Testament books (Romans 1:17; 1 Peter 1:16, etc). Even though they mostly lived in times when God was not silent as to further revelation, it was the Scriptures that formed the basis of their teaching. Of course, they only had the Old Testament, but they treated the only Bible they had with great respect and care, and it was the guide-post by which all doctrine was measured. Conversely, there are many things that are not revealed in the Bible. For instance, many prophecies await fulfillment. Also there are many details in prophecy which we will not know until they come to pass, for the written Word does not reveal everything, but reveals those things people need to know, and what God in His grace would have us know (1 Corinthians 13:12). Some things we just cannot be sure of, and while we may hold certain beliefs or develop theories about this or that, if they are not clearly set out before us in the Scriptures, we must take care not to be too dogmatic about them, and be prepared to change our minds if someone challenges our beliefs and theories with Scriptural evidence. One only needs to look at the many examples in history where often very learned and faithful people have tried to predict the date of the Lord’s return, only to leave many innocent believers devastated. In many of these cases, there is a dispensational aspect that has been ignored. However, even more often, something has been read into a verse of Scripture that was not really there. The perpetrator has not been able to see the possibility that he could be mistaken, for the Biblical support for that date was scant, or even non-existent. In times past, God often spoke through prophets and gave them visions. Mostly they were linked with Israel while they were still God’s chosen nation; that is before Acts 28. Today, it is not impossible for the Lord to speak to us via some supernatural medium, but it is certainly not normal in this current age. In the end, such divine experiences, if they are indeed that, must be compared with the Scriptures and must be consistent with them. All that aside, it is more appropriate for us today to ask the Lord for His spirit of revelation to guide our study and understanding of the Bible. God is its author, and it is therefore to be believed, to be handled with care, to be taken to heart, to be acted upon, and to be the final authority on topics related to our faith.